Comments: The word “common” in this map turtle’s name is a misnomer in Kansas. It is not common but rather is documented only in portions of the Neosho, Verdigris and Marais des Cygnes river drainages. The female has a large head with muscular jaws and a bony pad on the roof of her mouth for crushing mussel shells. The male has a smaller head and body. A small yellow spot behind the eye with a vertical light line between it and the eye separate this turtle from other Kansas map turtles. 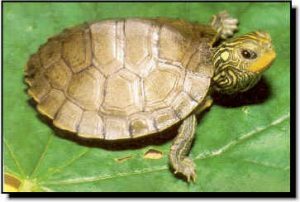 The common map turtle is shy and retiring and seldom seen.